Welcome, Foolish Mortals. 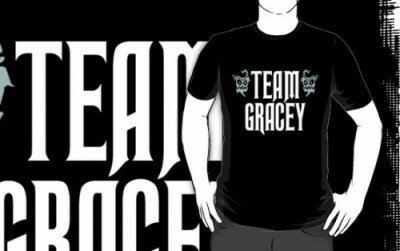 I am your Ghost Host this evening for your visit to Gracey Mansion. 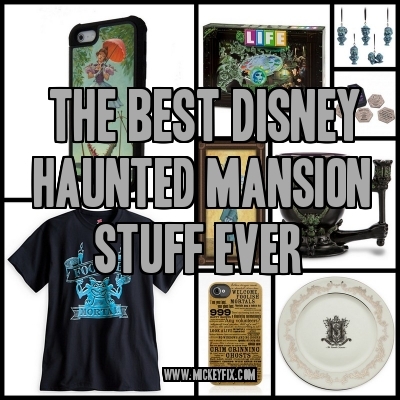 And tonight we will be taking a leisurely jaunt through our Favorite Disney Haunted Mansion Goodies on Mickey Fix. Yep; we love the Mansion just as much as you do. So much that we really DO wish our other car was a Doombuggy. And we’ve got tons of great stuff that will have you flashing back to the graveyard ASAP. So, sit back, relax, and let your Doombuggy guide you through all of the pleasantries available at your disposal with one swift click of a button… If you dare…Mwahahaha (ack! ack! ugh! Furball!) As I was saying, Mwahahahaha! Enjoy and Happy Haunting! There’s no better way to keep in close contact with the spirit world than with an iPhone. It’s true. Crystal Ball Technology is very 2006. Show that Madame Leota she doesn’t know what she’s talking about (Kidding! Don’t hurt me, Leota!) 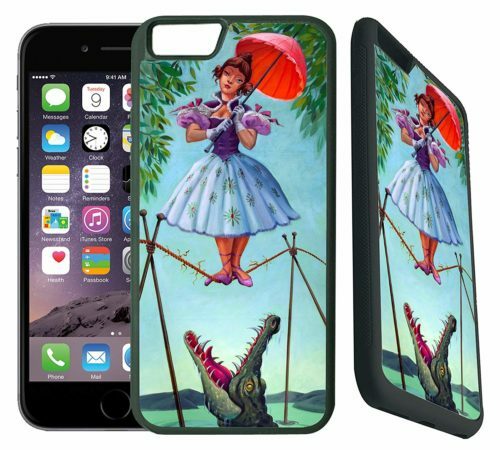 by sporting this Haunted Mansion iPhone Case over your New Fandangled communication device. Remember this game, Mortals? The click-click-click of spinning that wheel was always my favorite part. 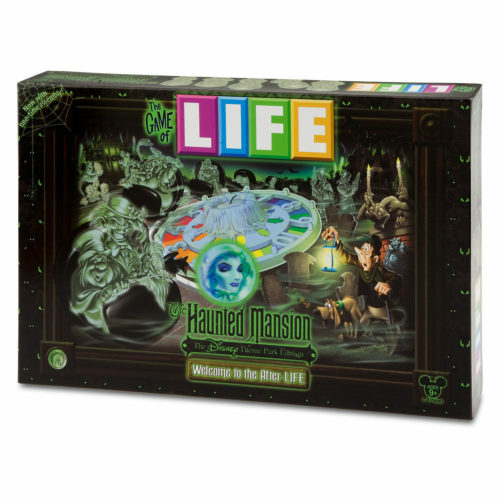 Trade in your Game of Life car for a Haunted Mansion Game of the Afterlife Doombuggy and share this fantastic board game with a whole new generation! They’re sinking and they just don’t care. We should all model our lives after Phineas, Ezra, and Gus: the three Hitchhiking Ghosts from Haunted Mansion. 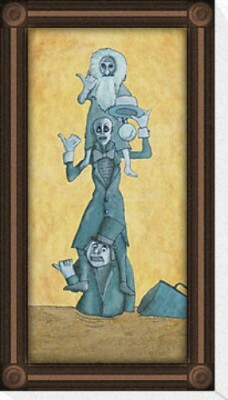 Let this Quick Hitchers Haunted Mansion Print hang in our living room as a reminder to go with the flow. No car? No sidewalk? No problem! Poison your guests? NEVER! 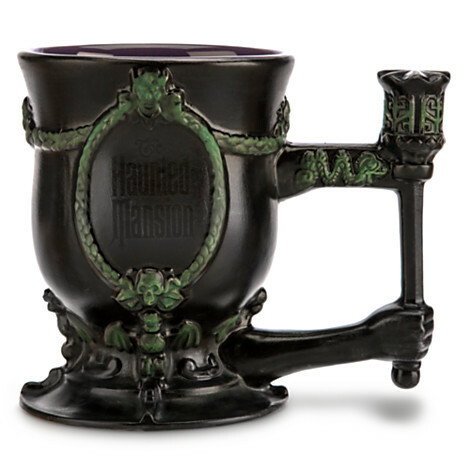 But keep them guessing when they get some hot apple cider served up in this creepy Haunted Mansion Mug with the extra hands at the bottom. I’m so thankful that little girl never looks down. Because that would make things go shaky in quite a hurry. Thankfully for us, we can enjoy this moment suspended in time and carry her in our back pocket. Check out this frighteningly adorable picture from the stretching room, lovingly immortalized on a Case for your iPhone 6, here. 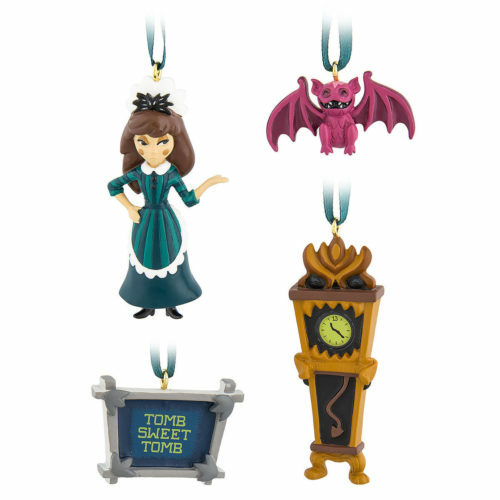 You think you could provide these cute Haunted Mansion Mini Ornaments with some hang time? Bill Shakespeare said, “To thine own self be true…”. So when you know you’re a Foolish Mortal, flaunt it. 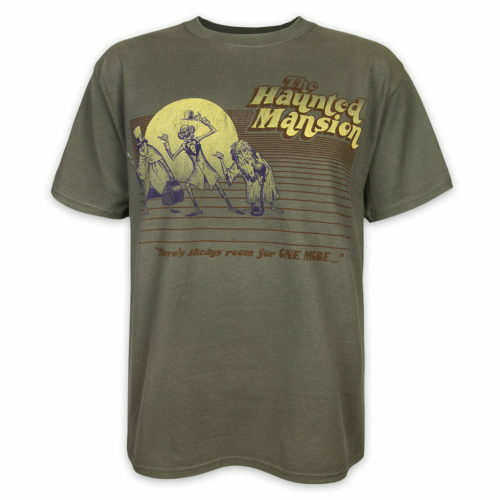 Take your gargoyle out for a walk and let your Silly Human Flag fly with this Haunted Mansion Tee! If you leave a spot on the dining room table, Mom’s gonna kill you! Better words were never said, before the fate of Dear Old Fred. Many people don’t know this, but Fred’s brother was ALSO named Fred. He was the one who was killed by a rock. The other one left his tea glass on the table without a coaster. Don’t end up like Fred. Either one of them. 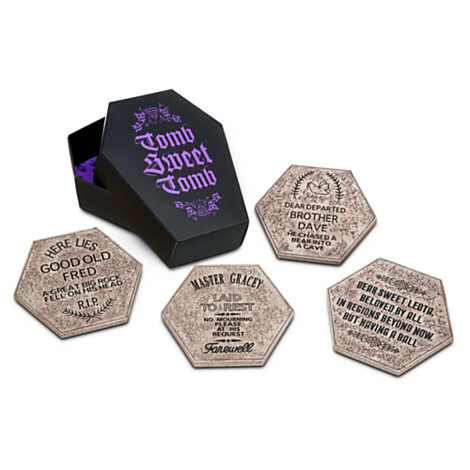 Keep your tables covered and your Mama happy with this Haunted Mansion Coaster Set. Are the eyes looking at you or THROUGH you? Unless you’re a ghost or made out of steam, they’re likely just looking AT you. But it’s still a fun question to ask. 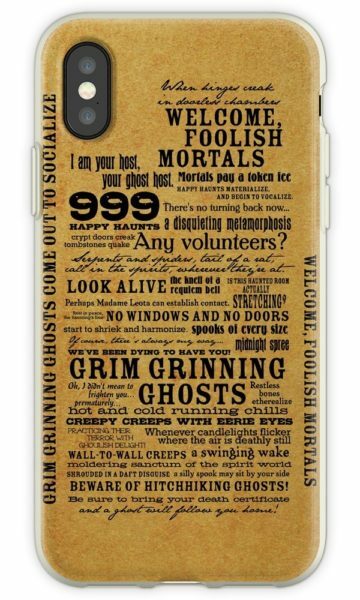 And something fun to HAVE is this Haunted Mansion Wallpaper iPhone Case. Quite purple. Quite fabulous. Take a look in Madame Leota’s Crystal Ball at all of the other goodies we have in store at Mickey Fix, including frighteningly-good Disney Gadgets and wicked-awesome Disney Memorabilia!